The food scene in Auckland just keeps improving, though it's hard to get excited by yet another pulled pork item on the menu. I thought I would take a look at what trends I've noticed in the past year, and what I think or hope will happen in the next. Recently opened eateries seemed to gravitate towards Americana, with burger joints/diners (Andy's Burgers & Bar, Fokker Bros, Ellice Road, Ralph's, The Burger Bach, Ceremony, Maidstone Burgers, Bearded Clam, Lucky Burgers) and slow cooked meats (Brothers Juke Joint BBQ, Miss Moonshine's, Woodpecker Hill, Hoggie's, Dixie Barbecue). Yes, that means jalapeño poppers and tater tots too, not to mention milkshakes and pies for dessert. We haven't taken things to extremes like creating ice cream baogers though. 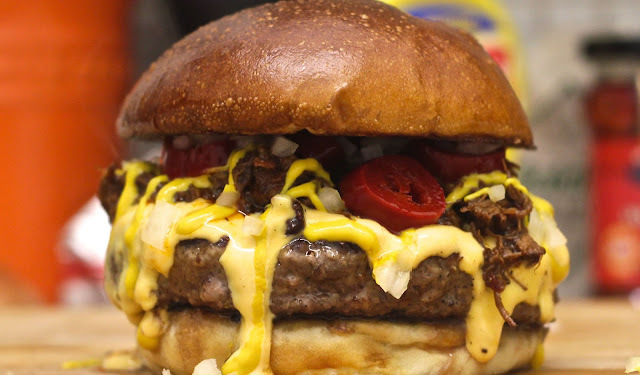 "Brisket Chilli Cheeseburger", photo from The Bearded Clam. There were some Asian fads as well: banh mi (The Bamboo Basket, a couple of permanent stores for Viet Sandwich, the now defunct Mi) became more prevalent, appearing in Vietnamese and non-Vietnamese eateries alike. Pork buns of the steamed and folded variety (a.k.a. gua bao), although sold by The Blue Breeze Inn and Acho's for several years, started popping up more too (Chinoiserie, Lucky Buddha, Old Quarter Eatery, Big Fish Eatery). There are more places catering for the health conscious (Greenleaf Organics, Love Organics, GAINZ, Elk Eatery, Johnny Mango, Balance Kitchen), and more organic grocery stores (new branches of Huckleberry, Commonsense Organics). Practically every trendy cafe has quinoa on the menu these days, along with smoothies containing chia, açaí or maca, and a bunch of juiceries have opened up too (Well + Good, Goodlife Juice Company, Pressed). Even the standard supermarkets now stock coconut sugar, coconut oil, kefir and the like. At the opposite end of the scale, a whole raft of specialty dessert stores have appeared. Apart from the high end Miann patisserie and cold stone icecream from Kapiti (okay, everyone is pretty excited about Ben and Jerry's too), the new openings seem to be mostly Asian, with snow ice (Snowman Cafe, Mellow), rolled icecream (Iceberg Icepan, Mellow), mille crepe (Fukurou Patisserie, Mellow), Japanese style desserts (CrepeZone, Beard Papa's), and Hong Kong style desserts (Fruitlife, Smile Dessert, MS Dessert, Echo Dessert) gaining ground. International bubble tea franchises (Gong Cha, Chatime) are now competing with exising ones like Hulucat, J's Tea and MomoTea. Thankfully, we seem to be seeing the end of the froyo craze. 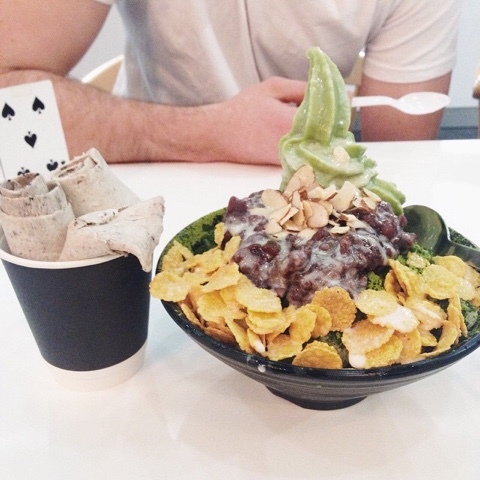 Rolled ice cream and snow ice from Mellow, photo from Amanda Lee. In terms of where we buy food, food trucks are totally in, with plenty of new vendors (I counted at least 6 in December), as well as more places for them to sell from (The Street Food Collective, The Food Truck Stop, The Truck Stop at La Cigale, new Auckland Night Market at Sylvia Park, Food Space events, various markets such as Victoria Park Market and Up Markets). Tiny shops are popping up in narrow properties (Lalele), in container stalls (Bing&Go), inside other shops (Fresh Pots), in back alleys (Little & Friday tuck shop) or basically time-share with another business. The market lane concept (Fortieth and Hurstmere, The Brickworks) is proving popular too. People also like to have hassle-free gourmet food at home. My Food Bag has expanded, not just delivering ingredients and recipes to new places, but offering new products as well. WOOP has launched a competing service, with more prep work done to reduce the cooking time, while Farro Foodkits offers something similar, but lets you choose your meals and add grocery items and/or sides. The Lucky Taco has crowdfunded their own Taco Kits, and The Roaming Dive has created a DIY Dive Slider Station (which they claim has been copied by Burger King). A couple of pre-order meal delivery services (Origin Foods, The Deli Llama) have opened, most notably with Eat My Lunch giving you the opportunity to help hungry kids at the same time. It feels like I am cheating a bit, since it is already the end of February (happy leap day - it always takes me ages to write a post! ), but basically, I expect more of what we are starting to see already. The opening of Beirut in Fort Street brought Middle Eastern food into the mainstream, and already we have seen plans for another Lebanese restaurant, Gemmayze Street in St Kevins Arcade. I have noticed more in the way of Persian food too, with Rumi restaurant in Parnell, Chelo market stall and Avishan home catering all starting up last year. I feel pretty ignorant about Middle Eastern food in general, so I'm looking forward to tasting and learning about more! Beirut's interpretation of a fattoush. Basic little eateries like the ones along Dominion Road or at food courts will always have their place, but what if you want to eat Asian food in a more upmarket setting? Saan (northern Thai), Artwok (Chinese), Indochine Kitchen (Vietnamese) and Lucky Buddha (Asian fusion) are some great recent openings, but there's still room for more. You'll already find Korean inspired menus at trendy cafes like Cali and Major Sprout, and Korean fusion stalls like Tiger Burger and Coreano have been rocking the food truck world, but where I think there will be a boom is in eateries that serve Korean fried chicken. Those lists of best fried chicken places invariably rave about American or Japanese style preparations, but the Korean version is its own beast. Double fried so it stays crispy, you can have it with a variety of sauces, not to mention the requisite beer and pickled radish cubes. The Rolling Pin, Wise Boys Burgers, Got Pasta and Mr Dog Frites are some street food vendors that have opened since the start of the year. No doubt there will be many more to come! Apparently, Kiwis are drinking less these days, and there are more teenagers who don't drink than those who do, assuming things here are similar to Australia and the UK. Matterhorn spotted a gap in the lower alcohol space last year, and put shandies and wine coolers on the menu. Many places offer mocktails and/or house made sodas too. The country's first "dry bar" even opened up on K'Rd, though it didn't last long, closing after only a month. Still, things are looking up for those who don't drink, or who prefer drink less, whether due to health or other reasons. The non-alcoholic staples of coffee, tea and water are now accompanied at some restaurants by juices, smoothies, milkshakes, coconut water, and/or 0% alcohol beers. The fruity and vinegary drink known as a shrub seems to be popping up in more places, (though I didn't care much for one I tried and already found it to be an acquired taste a couple of years ago). No doubt there will be more options for low or no alcohol drinks as the year progresses. It's always exciting when chefs experiment and learn from others. There were quite a few pop-ups, takeovers and collaborations last year (When Bao Meets Burger, Miss Changy's Good Night at Good Day, Judge Bao x The Pie Piper, Popped Culture, Pop Dining, even the Food Truck Challenge). Not only are these departures from routine fun and refreshing for both cook and diner, but they're sure to garner plenty of social media interest too. I think it's safe to say there will be more of this sort of thing to come, especially since the year has gotten off to a good start already with Jafa by Night and The Cult Project. So cronuts (and wonuts?!) are old news, and ramen burgers didn't quite take off here, but that didn't stop Project Paco (pancake tacos) from opening last year. In other parts of the world, they've come up with all sorts of food mash-ups, like eggettes as an ice cream cone (apparently this is taking New York by storm). Waffle dogs, cinnamon roll stuffed donuts, and chicken pancake sandwiches may not hit our shores any time soon, but surely "The Rebel Within" is both visually appealing, tasty, and technically challenging enough for someone to want to reproduce (apparently, "it's not that hard" and there's already a reverse engineered recipe). 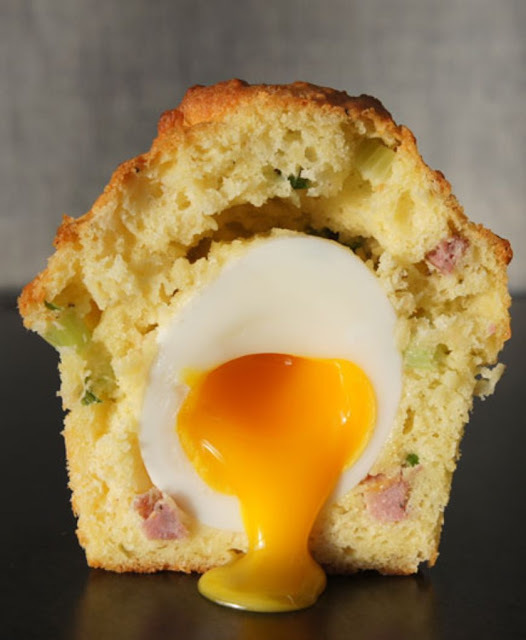 Fingers crossed—this is right up my alley as a breakfast food. "The Rebel Within" from chef William Warner, picture from GQ article. The Japanese have miso and natto, the Koreans kimchi, the Indonesians tempeh, and sauerkraut features in many Eastern European and Germanic cusines. Your local whole foods store probably already stocks these along with kombucha and kefir, due to the health benefits of probiotics in fermented foods. More and more, chefs will embrace these ingredients for their enhanced flavour as well—though the people behind The Cult Project making their own fish sauce from fermenting kahawai is pretty impressive. Sweet Val's already makes ice cream to order using liquid nitrogen (this gives it a smoother texture), and The Apothecary is one of two bars to serve nitro coffee in Auckland to make cold brew rich and creamy. I imagine more eateries will jump on the bandwagon in short order, since people are prepared to pay for quality and novelty (the misty effect when making ice cream is pretty theatrical). Business is shifting online, and the same holds true for food as well, whether we are talking about pre-made meals or raw ingredients. Although grocery delivery businesses like Oooby and FoodBox have been around for years, as have online ordering services for restaurants and takeaways, there will be an increased uptake at a consumer level, as well as more organisations that offer the goods and services. It particularly makes sense for producers to connect directly with customers in the case of seasonal produce such as cherries.